Man arrested for speeding, doing donuts in front of deputy in Williamson Co.
FRANKLIN, Tenn. (WKRN) - “I was just blowing off some steam.” Those are the words of a high-speed chase suspect moments after he was arrested for driving a 100 mph and doing donuts in front of a Williamson County Sheriff's deputy. Video from dash cam and motorists who witnessed it showed a wild, dangerous scene. A yellow mustang driven by Jeffrey Dimassa smoked the tires and did not one but two donuts directly in front of a Williamson County deputy and countless motorists at the light. Captain Rodney King with the Williamson County Sheriff’s Office says calls began to pour in earlier that afternoon. 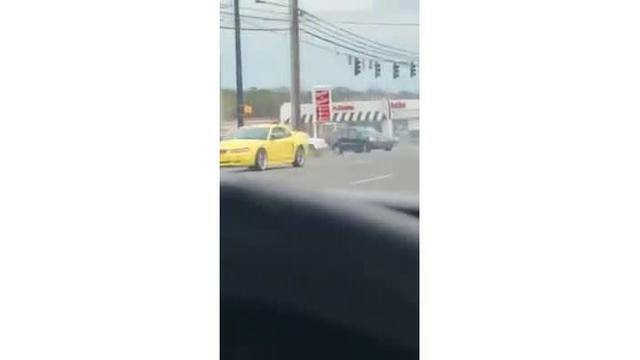 People were describing the 37-year-old Columbia man getting out of his Mustang in stopped traffic on I- 840 and running around the cars. Then he would get back in his Mustang and do donuts. That's when some minutes later, Williamson County deputy Joe Slabaugh picked up the Mustang at the T.A. truck stop around Goose Creek off I-65. The deputy activated his blue lights and the Mustang sped away. You can hear the deputy talking on video as he initiates a pursuit that reaches speeds of 103 mph north on I-65. Later in the pursuit, the mustang exited onto Highway 96, eventually slowed down in an intersection near the Kia dealership and did those two donuts. After almost an hour of putting himself and everyone else in danger, Dimassa pulled over, threw his keys out the window, then surrendered as the deputy moved in; gun drawn. “Get on the ground now. Do not move. Put your hands behind your back and do not move,” you can hear the deputy saying on the video. Captain Rodney King says the moments were tense as you can see Dimassa opening up his car door even while the car is still rolling. "You never know what will happen, what will come out of that car. It could be a runner, could be a gun, could be anything coming out of that car, you don't know. " Even though Dimassa denied drinking or using drugs, captain King says on video he admitted drinking earlier in the day. He stopped in Chapel Hill at a gas station and got some beer and drank it, but there was no evidence of any beer in the car. Family members told News 2 that Dimassa has been diagnosed with schizophrenia and bipolar disorder. He is currently in the Williamson County Jail under $20,000 bond.